Traffic is moving again on the M6 between Preston and Lancaster after smoke from a vehicle fire forced police to close all lanes. 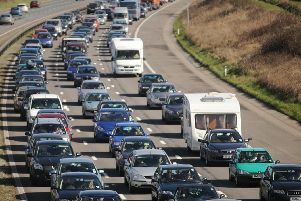 The stricken vehicle had been moved to the hard shoulder, where firefighters extinguished the blaze at around 10.45am. The incident is affecting traffic travelling northbound between M6 junctions 32 and 33. Police held traffic between junctions 32 (Preston, Blackpool M55) and 33 (Lancaster, A6) after the fire caused thick smoke to drift over across the carriageway. Due to poor visibility for motorists, police closed all northbound lanes from 10.15am to 10.45am. Traffic has now been released but lane 1 remains closed at the scene with slow traffic on approach. Highways England expect lane 1 to reopen between 11.15am and 11.30am.